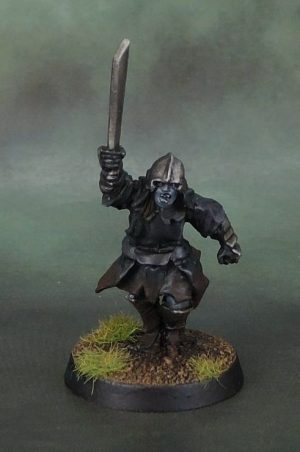 April 2018 Painting Round-Up | Azazel's Bitz Box. And into the second quarter we head. April’s painting haul wasn’t anything on the first three months of the year, as I hit the painting doldrums since the assembly task didn’t connect with me due to various factors, and being a building task didn’t motivate me to paint especially. Luckily, due to a combination of a last-days painting surge and the simplicity inherent in the Shadow sof Brimstone stuff, I managed to at least hit 31 models total for the month – so just beating the one-a-day for April. There was also this guy. Turned out that he fell off the tray when I was finishing his unit back in March. In April I found him and finished him off. But it’d be overkill to get them all out again for a group shot, so here he is. 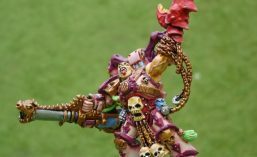 This entry was posted in Monthly Painting Round-Ups and tagged Monthly Miniature Painting Round-Up. Bookmark the permalink. Nah, I find it pretty inspirational and am happy that you’re knocking these goals out that you’ve set for yourself. And that many of us in turn, are completing our own little goals. Blah, blah, blah….Ok, nice mini! It’s a nice looking group of minis you completed overall this month. And glad you found the ‘one who fell off the tray’. Such a simple color scheme, but the different highlights and shades you applied make it look amazing. Heh, I (genuinely) wish I was that close to completing all of my models. I seem to have a bit of a purchasing OCD, but at least I’m finishing a decent number of models now (finally). Now I just need to start getting in more games with them than I have been! Phenomenal output mate – you are a machine! Exactly! Just like James Brown said!